What the heck is the "Paco's Taco's Task Force " you may be asking? Wellll . . . Membership on this task force changes with each meeting. Most meetings are held at Paco's Taco's on Manchester Boulevard in Westchester. (For those of you who are not familiar with Los Angeles, this is in the vicinity of LAX airport.) 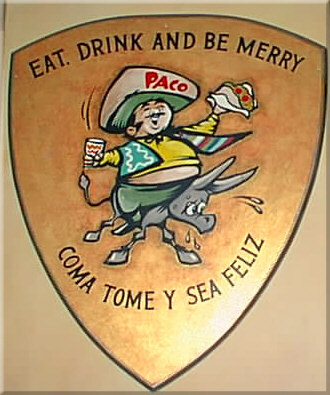 Paco's has excellent Mexican food, and also excellent margaritas, according to those who imbibe. It has been particularly convenient for us to meet at Pacos on one of the two days of the annual Computer Show sponsored by the Education Foundation and Flagg Management. Old timers still call it the Computer Show, even though the official name has been changed to the California Accounting and Business Show and Conference. Members of this task force may, or may not, be members of the California Society of CPAs, or current or former members of the American Institute of CPAs. Recovering members are welcome. Ann will administer the oath of membership at the upcoming meeting, after which each member will have equal voting rights. Out-of-state members of the CPAChat listserv are also members with full membership rights, whatever those may be. Agenda for each meeting is determined by the attendees, and a quorom is declared when at least three people are seated at the table, sober or not. The business portion of the meetings may last 20 to 30 seconds, and does not usually interfere with eating, drinking and socializing. These web pages were created by William Downs, aka "CyberCPA". Bill used to do a lot of web page work for the California Society of CPAs, over the 10 years when volunteers were allowed to do that sort of thing. And for several years, the Pacos Tacos Task Force pictures were located on a Cal Society web server. Not any more! Since May 2005, the PTTF web home is right here on cybercpa.com. Send an e-mail message. with any comments. Take a look at the big list of Web links for resources of interest to CPAs.